He was born on 25th May in the year of 1939. He is an actor from England and is awarded six big film awards for his marvelous acting. Among them we can start with Golden Globe award, Screen Actors Guild Award, BIF Award, Tony Award, two Critic’s Choice Awards, four Drama Desk Awards and it is impressing, he has managed to get six Laurence Olivier Awards. Ian Murray McKellen had the working record from Shakespearean genre to different theatres. He was also nominated for the sake of Academy Awards, BAFTA Awards and Emmy Awards. We all know him for the acting in the famous films X-Men where he was named Magneto and in The Lord of the Rings and Hobbit where he was named Gandalf. He never thinks that he has to ink on his body. 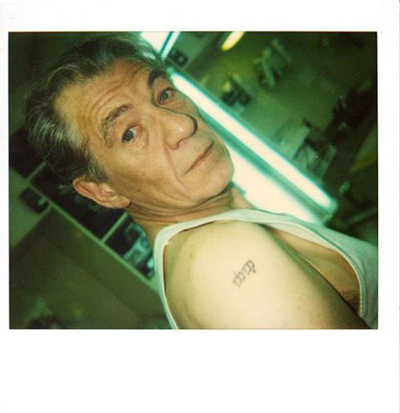 During the shooting of Hobbit he has to ink at last on his right shoulder. The shoulder tattoo is basically a number tattoo, which denotes the number 9 in Elvis. His acting is superbly acclaimed by the spectators and there is something very much overwhelming in his acting which is appreciated by all.